"There's Always a Trail": When a stranger named Handy offered to track down Cass Bailey's stolen money for a stake in the CB range, Bailey has nothing more to lose. "Home in the Valley": Steve Mehan had done the impossible when he drove a herd of cattle from the Nevada range to California in the dead of winter. But Mehan had little time to rest before tragedy struck. "Monument Rock": It had been many years since Lona Markham's father sent her from the rigors of ranch life to a convent school. Now she's returned to a wary, careworn man who hardly seems like the father she remembers. It was a name that caused the most hardened gunmen to break out in a cold sweat: Texas Ranger Chick Bowdrie. Pursuing the most wanted men in the Southwest, he knew all too well the dusty trails, the bitter cattle feuds, the desperate killers, and the quiet, weather-beaten towns that could explode into mayhem with the wrong word. He had sworn to carry out the law, but there were times when he had to apply justice with his fists and his guns. On a seldom-used smuggler's trail between Mexico and Austin, a man lies dying. Texas Ranger Chick Bowdrie takes the stranger's body to Valverde, the nearest town. Upon arriving, a crowd gathers, watchful and silent as Bowdrie tells his story to the sheriff. In the crowd is the beautiful blonde Rose Murray, owner of the RM Ranch. Rose explains to Bowdrie that she has reason to believe the stranger was coming to see her in order to right a terrible wrong. Twenty years ago, the Chilton Gang robbed her family. 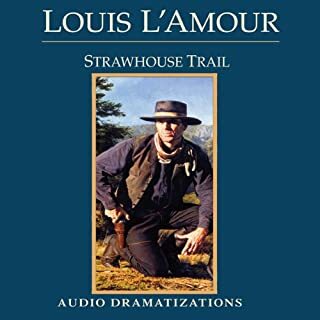 This set contains four thrilling dramatizations of Louis L'Amour's short stories, featuring all the excitement of the authentic West, the fierce passion and determination of the men and women who dared to tame the rugged terrain and call it their home, the villains who threaten their dreams, and all those who sought their own destinies across a vast western landscape. Overrun by hard-bitten miners, gamblers, and the kind of no-account drifters that follow the gold camps, Basin City is a place where no respectable citizen feels safe. That's why three of the town's foremost businessmen have gone and hired a new marshal. Tomorrow he'll be in charge of protecting a stagecoach carrying over a quarter million dollars in gold as it moves out of the Basin City depot. Tonight he'll be defending his life. Great Dramatization - Complete Short Story! Where the real frontier begins...A young cowpuncher stakes a claim that can only be sealed with fists and a .44 Colt.... A gunfighter, tired of violence, finds himself pushed down a trail of bloody revenge.... From purple sage to gambler's gold, from a senorita's tempting smile to a splash of blood in the dust, here are stories with a distinctive L'Amour twist. A quiet farmer defends his honor in a moment of panic and luck...only to find true courage on the run from the dead man's brothers. Gritty, tough, and unflinchingly authentic, here is the West as it really was: a land where for every friend there is an enemy, for every handshake a fist, for every dispute a resolution - usually in an explosive showdown of blood and bullets. Bud Miles was a boy when he crossed the Mississippi. But Bud buried his father after an Indian attack, and as the wagon train pushed on through Sioux country, the boy stood as tall as any man....Tell Sackett killed cougars at 14 and fought a war at 15. Now Tell was hauling dangerous freight - a soldier's wife and a fortune in gold--knowing that someone wanted him dead....Laurie Bonnet was a mail-order bride who thought she was a failure on the frontier. Life on an Ohio farm couldn't hold young Bill Carey. He wanted the adventure he knew waited in the territories to the west. He'd drifted into the outlaw life and found himself shot up, a lawman on his trail, holed up on a small farm near the lair of Tabat Ryerson. Ryerson, the man who'd introduced him to cattle rustling and bank robbery, was a cold-blooded killer, the man who'd turned the sweet young woman who'd saved Carey's life into an unwilling accomplice. Scott Miles and his son Billy are on their way to a new life in New Mexico, but fate deals them a bad hand in the deceptive currents of the Missouri River. Their wagon nearly splintered, one mule of their team lost in the river, Scott and his boy have almost no chance of joining the last wagon train heading out before winter closes in. But Scott wasn't counting on a miracle in the form of a strong-willed woman and the unwavering faith of a young boy. In a remote corner of Utah lies the secret outlaw kingdom of Ben Curry. For 15 years Curry has ruled supreme, as his men have pulled jobs from Canada to Mexico. But the king is getting old, and he wants to turn his legacy over to someone younger, tougher. Mike Bastian is Ben's adopted son, a young man who can handle a knife, a gun, his fists, and who's been trained in every criminal skill. But so far he's a man who's never broken the law. Now, as treachery explodes among Ben's riders, and two honest lawmen, Tyrel Sackett and Borden Chantry, begin to zero in on the gang, Mike must choose between his loyalty to Ben and his yearning for a different life. Yet when the guns start echoing off the Vermilion Cliffs, the time for choosing is over, and the time for battle has begun. 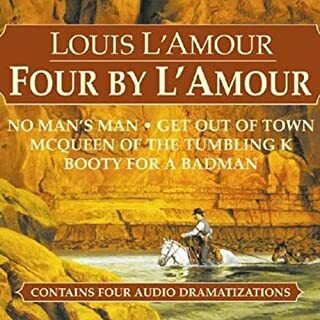 ©2005 Louis & Katherine L'Amour Trust (P)2005 Random House, Inc. Random House Audio, a division of Random House, Inc.
Louis L'amour's stories are always the best. Listening to this story, furthermore, is not like listening to a story, it is like watching a movie, or even better, like actually being on the scene. The story starts by establishing deep personal foundations under the characters, and proceeds to build excitement and suspense to a peak. 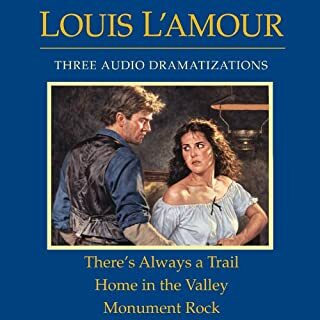 This program also includes a bonus hour (after 2+ hours of the story) about the making of the audio, and concludes with some personal time with the author himself speaking: the late Louis L'amour. If there is anything disappointing about this, it is that there are not more like it available, NOW. This dramatized book in another of great fiction relating to our western heritage. There is an explanation at the end of how the production was accomlished as well as a brief conversation with the author. I highly recommend this title to any reader who enjoys western drama. 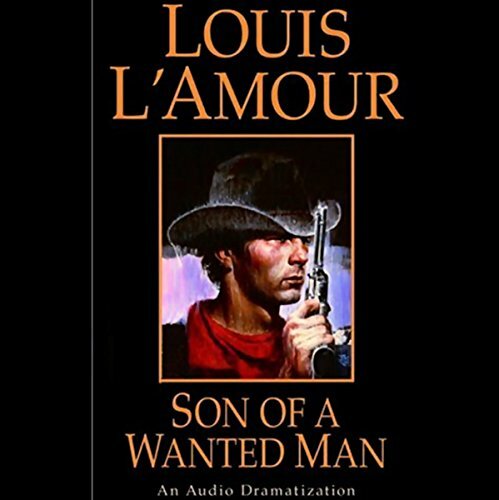 What did you love best about Son of a Wanted Man (Dramatized)? What was one of the most memorable moments of Son of a Wanted Man (Dramatized)? 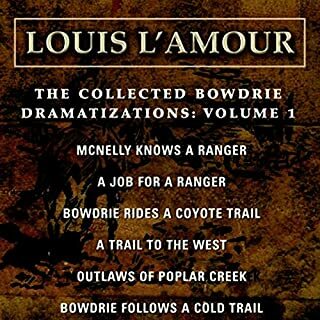 I am a huge fan of Louis L'Amour books. This is the first one of his books I've listened to that's dramatized. After listening to all the commentary I understand what they were trying to accomplish with it and I think they did a pretty good job. But as someone who has read all of these books multiple times I found the changes they made to the story to make it work in this format distracting and disappointing. I think this is a great choice for someone who hasn't read the book. 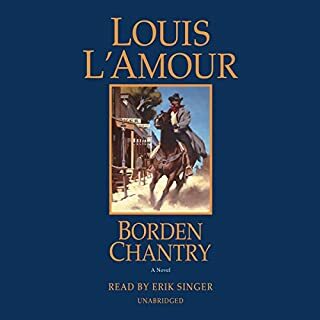 My all time favorite Louis L'Amour audiobook. Very well written, performed, and amazing sound effects! enjoyed this a lot. great story & clear dialogue. beautiful music background. one of our favorite authors. Good voice acting but different plot. The basic idea is the same, but they changed a lot of details. Warning though, the last forty minutes aren’t part of the actual audio book. This is a good story, but if your expecting the story written by Louis L'Amour this isn't it. This is a stand alone story very loosely based on the original. 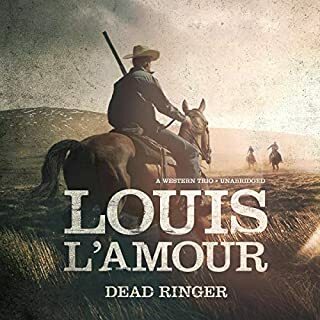 I did enjoy it but I had to keep reminding myself not to remember the original which is one of my favorite Louis L'Amour stories. Not as good as the untouched Louis L'Amour stories, because the dramatization loses the feel of the author's writing. We won't purchase any more dramatized L'Amour stories.